I should probably start a "Patagonia Propaganda" label on this blog. 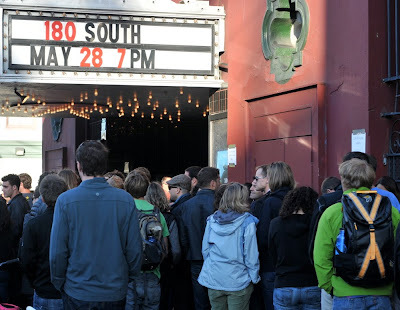 What can I say, the Kool-Aid tastes good... 180 South is an independent film that documents a Jeff Johnson, a Bay Area native and avid outdoorsman, following an incredible journey taken by Doug Tompkins and Yvon Chouinard (founders of The North Face and Patagonia, respectively) when they were still dirtbags. The film is available right now at Netflix (which sponsored the project along with Kashi and, you guessed it, Patagonia) but is also conducting a small big screen tour. The San Francisco screening sold out and attracted all sorts of fleece and performance base layers. For some reason, I didn't enjoy the movie as much as I thought I would - maybe my expectations were too high. The movie doesn't have a lot of crazy extreme footage (I can't actually think of any) and instead focuses more on Jeff's journey to Patagonia via Easter Island on a sailboat and land conservation efforts in Patagonia. I liked the journey focus but it was a bit slow and I thought it was over-narrated. Others that I saw it with thought it was incredible. Besides the majestic scenery of Patagonia, Doug and Yvon stole the show: Yvon for his one-liners and Doug for his debonaire hiking apparel.